Stretch marks are commonly formed during pregnancy and after rapid weight loss. 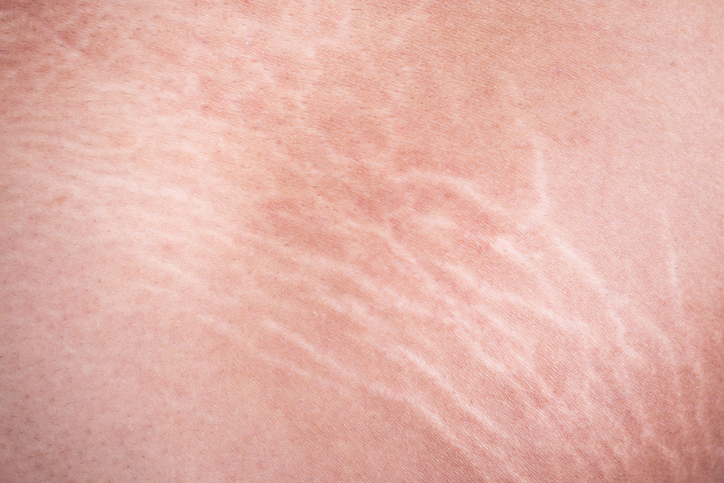 There are treatments available now to remove the appearance of stretch marks, but unfortunately most of them are temporary fixes. The good news is, there is a new procedure called EnerJet that allows stretched skin to be restored to its natural colour, diminishing the appearance of stretch marks and other lines. EnerJet is an “innovative dermal remodelling system” that uses specially designed technology for effective non-surgical face lifts, scar remodelling and dermal thickening (a treatment to correct tone and texture of skin as it ages). As a needle-free procedure, EnerJet is a good example of minimally invasive surgical aesthetics. Suitable for all skin types from dark to fair, it can be used to improve the skin’s appearance on all areas of the body, including delicate areas such as the hands, décolleté, neck, cheeks, around the eyes, lips, forehead and chin. Aged skin is characterised by reduced collagen, resulting in a wrinkled appearance, brittle texture and dryness. EnerJet (pictured above right) employs a bespoke Jet Volumetric Remodelling (JVR) technology that compresses hyaluronic acid (a dermal filler known for its skin-plumping and hydrating properties) in an air pressure pump before delivering it deep into the ageing skin. Through a controlled and precise needle-less jet, molecular mass particles are delivered at an accelerated speed through tiny entry points into the depth of the dermis. This process stimulates collagen synthesis, and the hyaluronic acid particles attract water molecules in the dermis, thickening and hydrating skin to produce a visible aesthetic improvement. The results of the treatment are almost immediate. One will notice that the skin is visibly refreshed and plumped, with fine lines and wrinkles successfully smoothened. Over time, long-term results include remodelled skin that boasts increased elasticity and thickness. Depending on the texture of the skin and the areas of concern, a typical treatment regimen requires three sessions per target area at intervals of approximately four weeks. The procedure is safe with minimal downtime. There could be minor and tolerable pain, which a topical anaesthetic cream should be able to alleviate. Each treatment lasts just under 20 minutes, making it perfect for a lunchtime beauty fix.